Killer Characters: Skye fights her way back to the blog! Skye fights her way back to the blog! Phew! I know it’s been a long time since I blogged here, but it’s been tough fighting off all my relatives and friends who wanted to drop by and put in their two cents. But I’m here now and a lot has happened in the months that I’ve been gone. Just to remind you, here in Scumble River, it is October 2005. As always, my job as a school psychologist has been hectic, and as we head into November, all the holiday issues will begin to surface. While kids that come from happy families may Thanksgiving and Christmas, those with less ideal situations often feel torn between feuding parents. And for those who have lost a loved one, it’s even worse. My counseling chairs get a real workout right after those school breaks. Recently, however, I’ve been dealing with Rex Taylor, a music promoter who was determined to turn Scumble River into the Branson of the Midwest. I thought Missouri was in the Midwest, but apparently not the part of the state that Branson is located. Anyway, he blew into town, put on a free concert featuring Flint James, a hot new country music star, and Suzette Neal, an up-and-coming one, then tried to sweet-talk everyone into turning our community into a tourist trap. Needless to say, sides were taken, battles were fought, and a murder occurred. Most recently, I had to intervene when some of my fellow Scumble Riverites wanted to shut down Tales and Treats, the new bookstore. Really, who in their right mind wouldn’t love having a bookstore in their town? Ah, but that’s the rub. Several of the people involved weren’t in their right mind. As it happens, Suzette’s mother died when the family lived in Scumble River many years ago, and she asked me to help her find out what really happened to her mom. Since I’m the police psych consultant, and my boss, Chief Wally Boyd (he’s also my fiancé, but that’s here nor there) gave me the go ahead, I agreed to look into it. Sadly, the situation quickly turned into a case of not one suspicious death, but two, and I had my hands full trying to figure out if the deaths were connected. Adding to my stress was a cute little dog that I somehow ended up fostering, and boy, was my cat Bingo ticked about that. Now I know where the term hissy fit came from. On the personal front, Wally and I had to deal with a major threat to the annulment he’s been seeking to dissolve his previous marriage. He’s been really understanding about my wish to be married in the Catholic Church, but this situation nearly pushed him past his limits. And then there was Uncle Dante, the Scumble River mayor… But that’s a story for another time, or you can read all about that in Murder of a Creped Suzette coming out October 4, 2011. 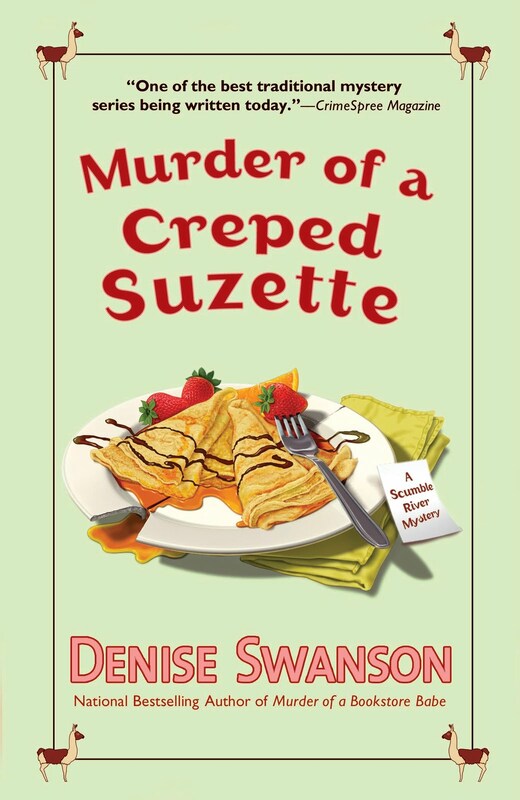 Best wishes for success of Murder of a Creped Suzette and for peaceful, joyful, murderless holidays--although I wouldn't bet on the last. This is one series I want to read. I just wish I could get them as e-books. But I do want to ask, will the books in this series ever come out as e-books? If no one knows the answer can you direct me to who or where I can ask/find out. 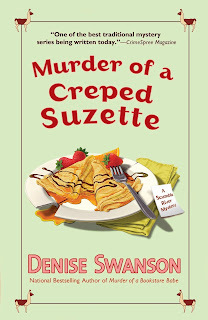 BusyMom--Currently books 1-3 and 8 are available as ebooks, and Murder of a Creped Suzette will be available Oct.4. I've signed a contract for the remaining books (4-13) and Penguin has them in production, but I don't have a date yet for their release. This sounds like a lot to take in, Skye! But really, people wanted to close down a bookstore??? Can't wait for this installment Skye! I remember when you were just starting out, before Hayley Snow was even a glimmer in an author's eye. Congratulations! It is hard for me to read the books with the font and size they use. So my e-reader became my best friend (well one of them). And if needed I will buy a book at a time until it comes out on digital. I discovered this series a long time ago. Love it! What is funny for me in this blog entry is the business about you adopting a puppy, Skye, because our family adopted a cute and frisky pug terrier mix just a few days ago and our 14 year old had a hissy fit. She's still having hissy fits, daily. Hourly, even. What did Uncle Dante do? Good luck on your upcoming release. Never a dull moment in Scumble River! I'm always a little nervous before my new adventure is published.